Regal Princess as seen at the quayside in Amsterdam at the 18th of may, 2003. The story of this ship and her somewhat older sister Crown Princess starts as early as 1984, when the specifications for their building were proposed by Sitmar Cruises to the Italian shipbuilder Fincantieri. The old Italian Sitmar Line, that had been formed in 1938, was renamed as Sitmar Cruises in 1970. Before that, it was a company dedicated to carry immigrants from Italy and southern Europe to South America and also Australia. Untill 1984, the company never built any passengerships themselves, always sailing with former Victory-ships of the 1940's and rebuilt freighters later on. In 1952 they had bought their first true passengership, the 1930-built British India liner Kenya. This ship was renamed Castel Felice. In 1970 Sitmar lost their mail contract to Chandris Lines of Greece and concentrated on cruising onwards. Because of this, they had to update their fleet because of changed passenger-demands. But it took the company another 14 years before they built the Fairsky, a true modern cruiseliner thet was the forerunner of new tonnage that had to be added to survive in the world of cruising. Because of the great succes they achieved with this ship, an even bigger one was ordered in 1986, the latter Star Princess and Arcadia. Negotiations between Sitmar and Fincantieri and Chantiers de L'atlantique awarded this ship to the French yard, but the Fincantieri deal also was renewed and two new ships would be ordered from this Italian yard for delivery in 1989 and 1990. With almost 70.000 tons these ships would be the biggest Italian ships and also were rated among the biggest cruiseliners in the world, only surpassed by Royal Caribbean's Souvereign-class. At once, Sitmar would be one of the biggest cruisecompanies in the world. A more detailed look at their order and design are explained at the page of the first of the ships that was delivered, the Crown Princess. It was also a very prestigious order for the Italian company Fincantieri, because there were no major passengerships built in Italy since 1966 when Eugenio C. was delivered to Costa Lines. Because it was very important for Italy, the architect awarded to design the ships would be the Italian Renzo Piano, worldfamous for his futuristic design of landmark buildings. Besides these ships, Piano is also the architect who designed the Centre Georges Pompidou in Paris, the Tjibaou Cultural Centre in Noumea, New Caledonia and the Kansai International Airport in Osaka, Japan. He was asked by Romano Prodi, then a director of IRI, the parent company of Fincnatieri and later Italian Prime Minister, to give an Italian vibe to these new ships. His original design (as a swimming dolphin) was more spectacular and futuristic then the final ships look like today, because his extravagant ideas were rejected as too costly and too expensive to built. Because of that, these ships were called Piano's 'halved ships' by some critics. 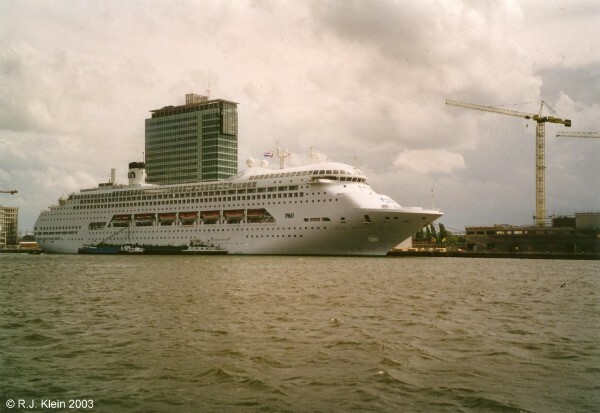 In july 1988, Sitmar was bought by P&O Lines and integrated in their Princess Cruises brand, just one month after the first ship was laid down. She floated out on 25th of may 1989 with her new name Crown Princess. The second ship, Regal Princess, floated out on the 29th of march 1990 as yardnumber 5840. Because of their revolutionair design, these ships became truly populair and easily recognizable in the modern cruiseage. When built, Regal Princess measured some 69.854 tons, had a lenght of 245,10 meters, was 32,28 meters wide and her draft was 7,80 meters. She was able to sail with a maximum of 2050 passengers, in lower berths this number was down to 1560. Also, 696 crewmembers were aboard. Regal Princess flew the Liberian flag, being registered at Monrovia. Her trials started at the 5th of june 1991 and she was delivered to Princess Cruises at the 20th of july of that year. But the rapidly expansion of Princess Cruises from the mid-nineties onwards, was the reason that these modern ships of the 1990's were outdated a bit at the end of the same decade already. Princess Cruises sold or transferred all of their ships built before 1995 to get one of the youngest and most up-to-date fleets in the world at this very moment. Crown Princess was transferred to the German-based Arosa Cruises in 2002. This company was part of the DSR-Group (Deutsche Seereederei) and sailed with rivercruise vessels at that time. Deepsea cruising was something new for Arosa. Crown Princess recieved the name A'rosa Blu. Also Regal Princess was supposed to be transferred to this company, but that never happened. P&O Princess itself was bought by Carnival Corporation in 2003 and the deepsea cruisedivision of Arosa Cruises was discontinued. A'rosa Blu transferred to the also German Aida Cruises as Aida Blu for Baltic cruises out of northern Germany and Regal Princess stayed with Princess Cruises for the time being. Regal Princess was kept within the fleet of Princess Cruises somewhat longer then her sister, especially after her transfer to Arosa Cruises fell through. At the end of her 2007-season, she was finally leaving the fleet of Princess Cruises, as expected, when she was added to the ever growing P&O Australia brand for cruises in Australia and southern Asia. Just before her transfer, at the 18th of february of 2007, the ship ran aground near Huatulco, Mexico and two cruises had to be cancelled for repairs. Her first cruise for P&O Cruises Australia started at the 1st of november of 2007 under her new name of Pacific Dawn, after she had been given an enormous welcome at Sydney. She left Sydney for Vanatu and New Caledonia that day and she keeps sailing the southern Pacific as well as round Australia cruises and cruises in southeast Asia.